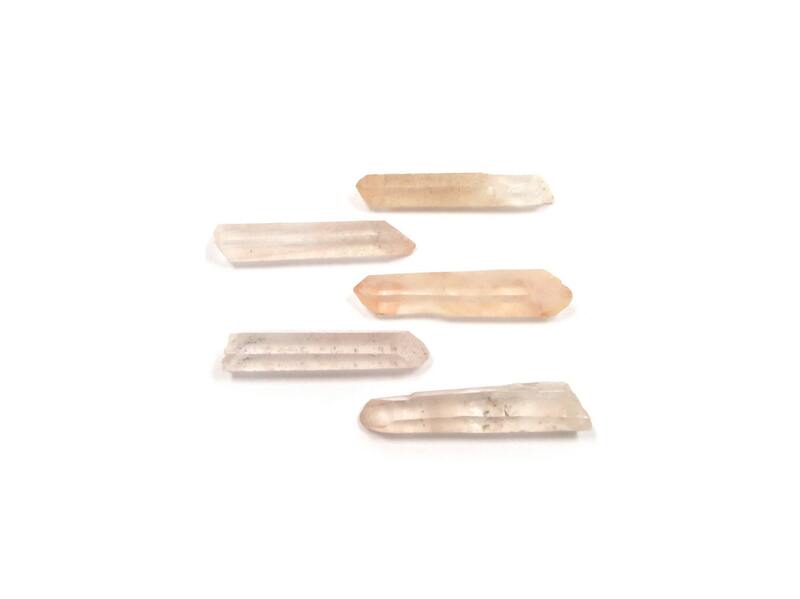 New in the shop this week: Spirit Quartz! 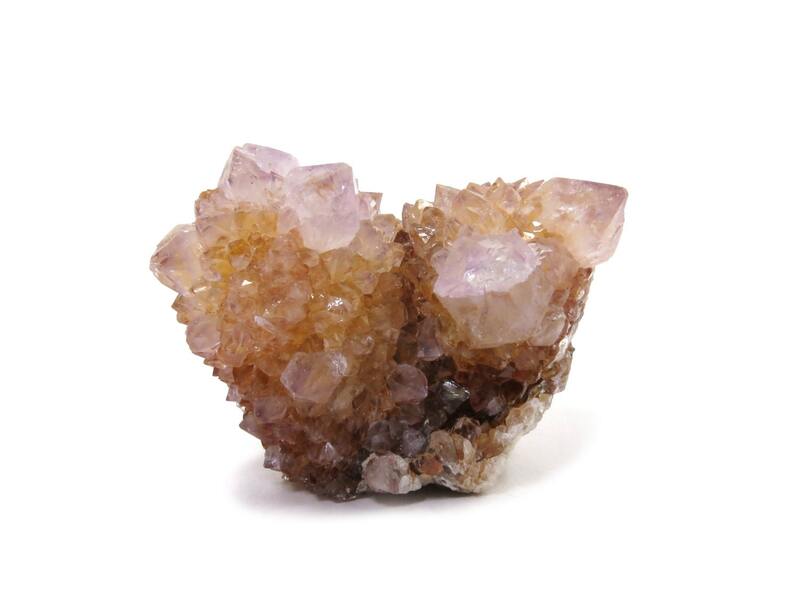 Spirit Quartz crystal has a hexagonal (trigonal) system. 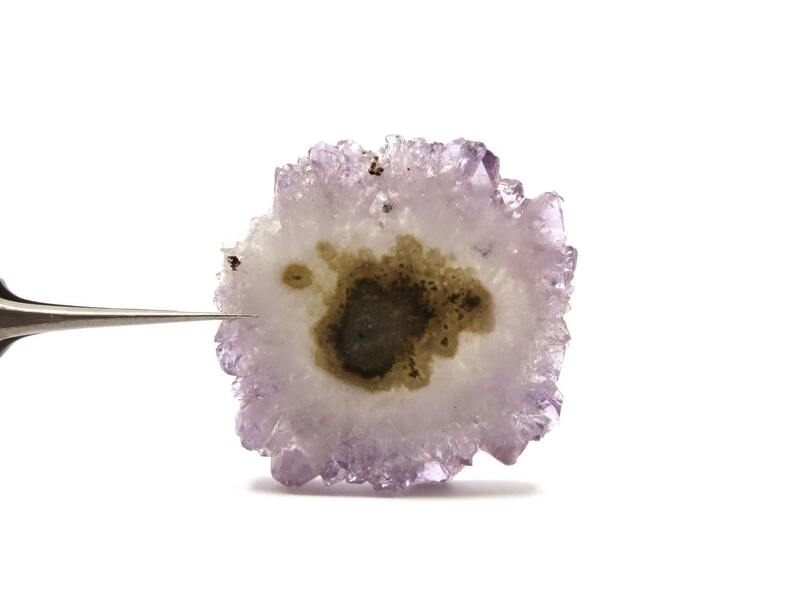 It is characterized by the formation of many small Quartz druzy crystals surrounding larger single points. 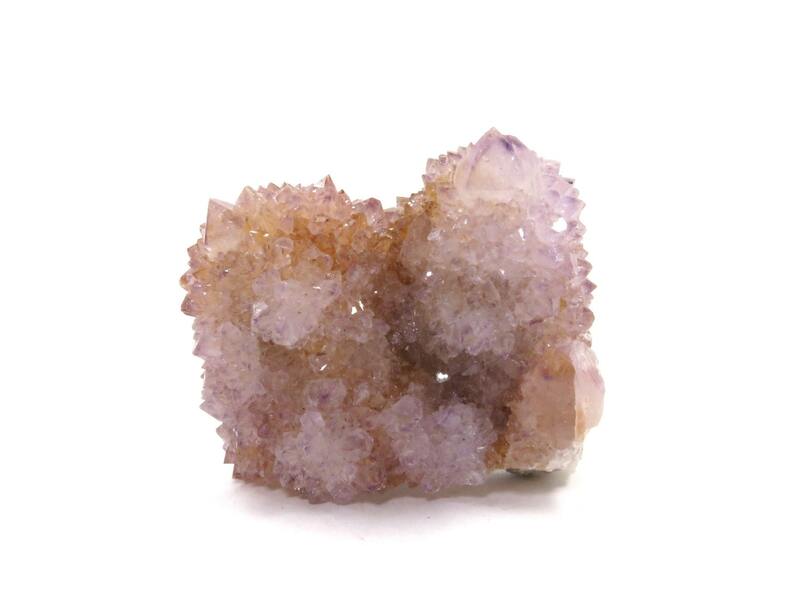 Spirit Quartz comes in several colors including clear, orange, and purple. 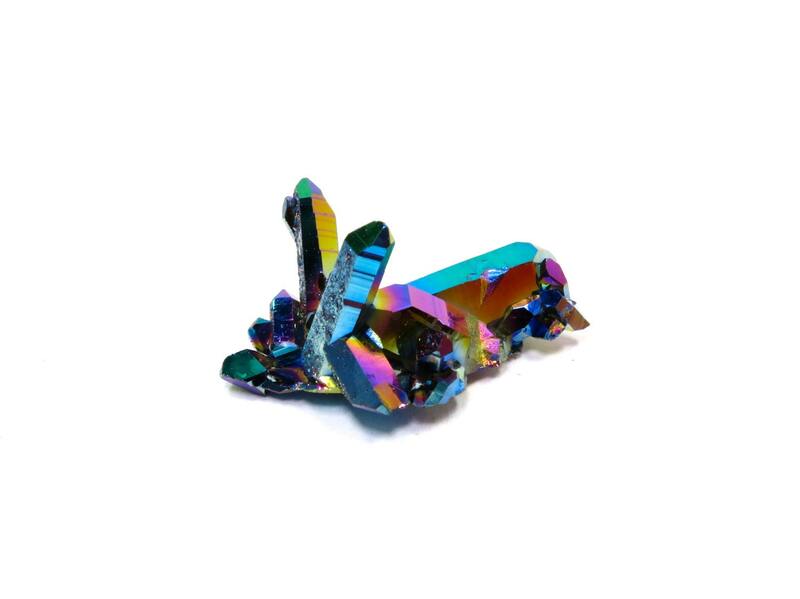 The color of the crystal depends on the minerals present. In lore and legend it was used for peace of mind and freedom of fear in meditation, anxiety, and harmonizes energy. Country of origin: South Africa. Also known as Cactus Quartz and Porcupine Quartz. We’re having an Instagram giveaway!! Enter to win this beautiful deep purple Fluorite Crystal Specimen!! Here’s what you need to do: follow @instantkarmashop and repost with @instantkarmashop and #instantkarmarocks (if you are private, repost and enter a comment below to enter). Repost and tag up to 1 time per day for more entries! Open world wide! Terms and conditions: No purchase, payment or contribution necessary to enter or win. Open world wide to adults ages 18 or older, void where prohibited by law. Each entrant can enter a maximum of 5 times (1 entry per day on Instagram). Odds of winning depend on number of eligible entries received. The winner’s name will be chosen at random and will be announced via Instagram on Tuesday August 5, 2014. Any winner who fails to claim their prize after 5 days of notification will forfeit the prize and another winner will be selected. Ends Saturday August 2, 2014 10pm EST. Winners outside of the U.S are responsible for any and all duties and custom charges that may be incurred. Crystal is approximately 2.25” x 2” x 2”. We’ve spent the month of May re-stocking our etsy shop with both customer favorites and new unique specimens! Stop by and see what’s new! 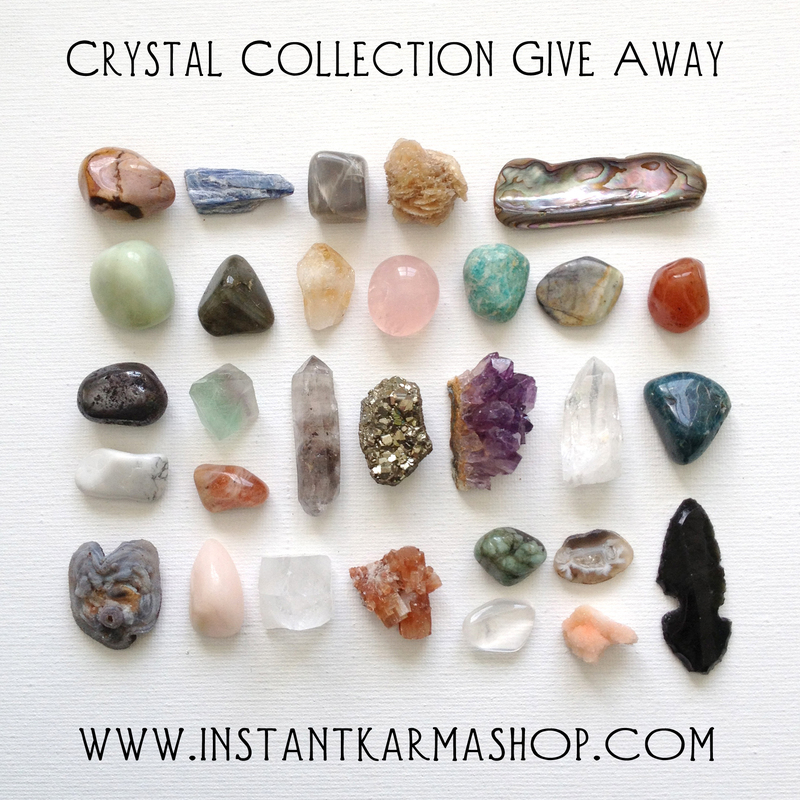 The Instant Crystal Collection Give Away Winner!! We are amazed by the overwhelming number of entries that we received for our very first giveaway. On instagram, facebook and instantkarmashop.com combined, we have received over 1400 entries in total. It has been fun to see so many new faces and we are thrilled beyond measure that so many wonderful people love crystals as much as we do. Our deepest gratitude goes out to each and every one of you for your participation in this giveaway! We sincerely wish that every single one of you could win, but unfortunately there can be only one winner. And the winner is… Donni of The Magic Onions! Congratulations Donni! We will be in touch with you shortly for your mailing address. Thank you all again for your entries, comments and support! This giveaway was so much fun and we will definitely be doing more of them in the future! 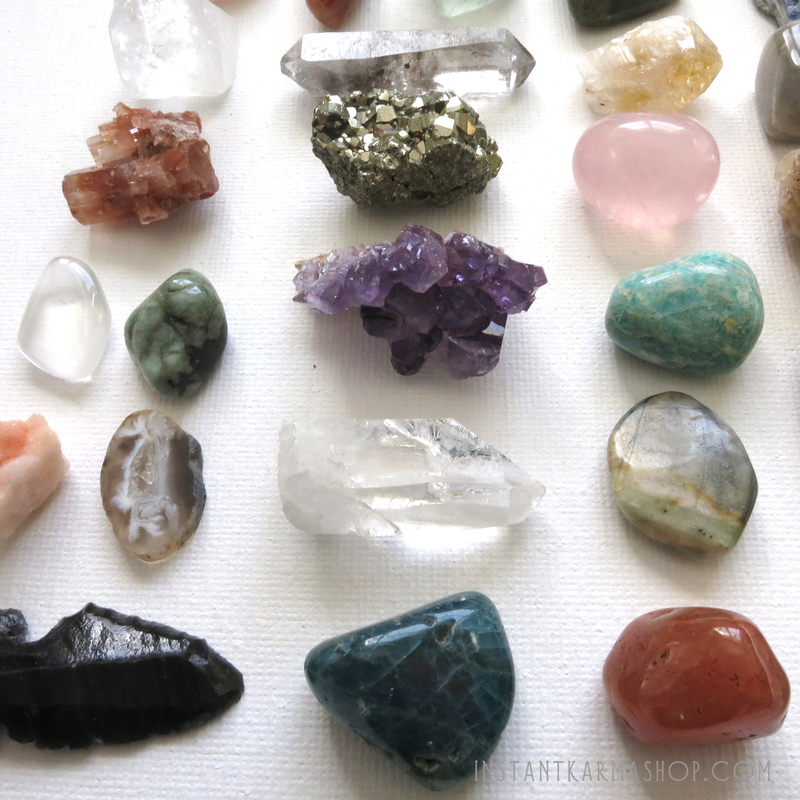 Want to win all of the crystals shown in the photo above? Well, it’s your lucky day because we’re having a GIVEAWAY!! 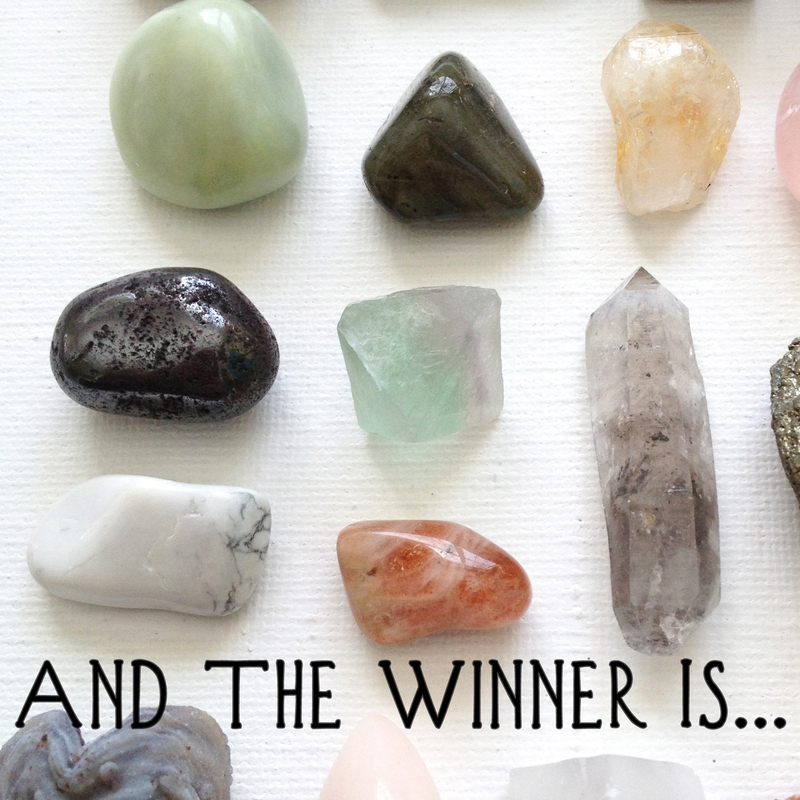 Win an Instant collection of 30 rough and tumbled crystals valued at over $85.00. 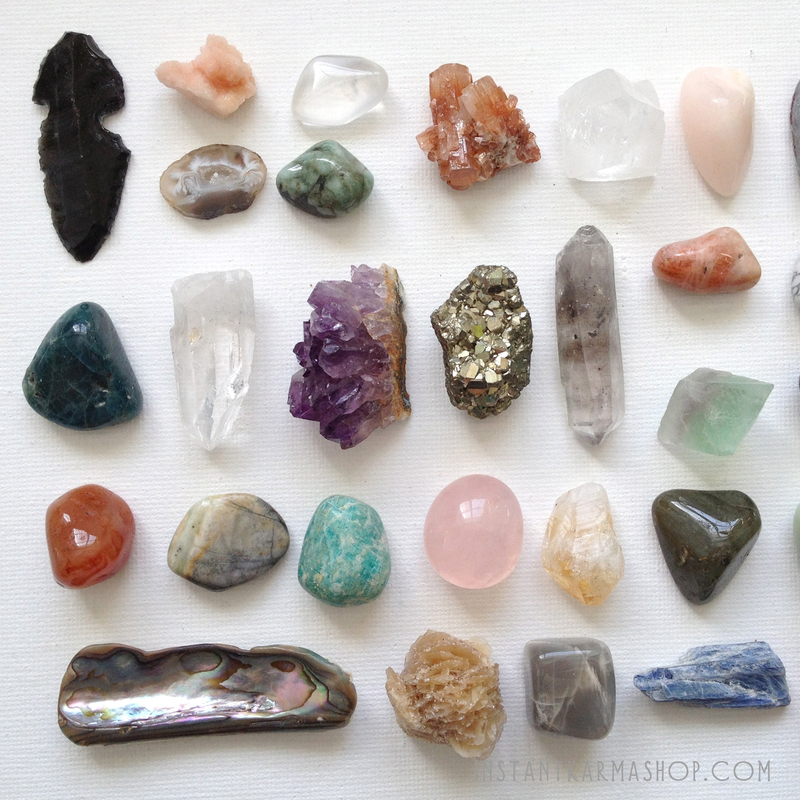 What you’ll get: All of the crystals shown in the accompanying photos. One each of the following crystals: tumbled Jasper, rough Blue Kyanite, tumbled Grey Moonstone, rough Desert Rose Selenite, tumbled Abalone Shell piece, tumbled Jade, tumbled Labradorite, rough Citrine point, tumbled Rose Quartz, tumbled Amazonite, tumbled Picasso Stone, tumbled Carnelian, tumbled Hematite, rough Fluorite Octahedron, rough Tibetan Quartz double terminated point, rough Pyrite specimen, rough Amethyst cluster, rough Water Clear Quartz point, tumbled Apatite, tumbled White Howlite, tumbled Sunstone, rough Chalcedony Druzy specimen, tumbled Mangano Calcite, rough Apophylite Point, rough Aragonite Cluster specimen, tumbled Emerald, tumbled Girasol, polished Agate Geode Slice, rough Cranberry Amethyst Druzy specimen and hand knapped Black Obsidian Arrowhead. Crystals are approximately .75” – 2.25”. Deadline: Ends Thursday February 27, 2014 at 10pm EST. 1. Facebook: Like and comment on the giveaway photo. Click here to enter on Facebook. 2. Instagram: Follow @instantkarmashop and repost giveaway photo from our feed with @instantkarmashop #instantkarmarocks (you can repost the photo once a day for a maximum of 10 entries). ✭ Terms and conditions: No purchase, payment or contribution necessary to enter or win. Open to residents of the U.S.A, Canada, United Kingdom, and Australia, ages 18 or older (void where prohibited by law). 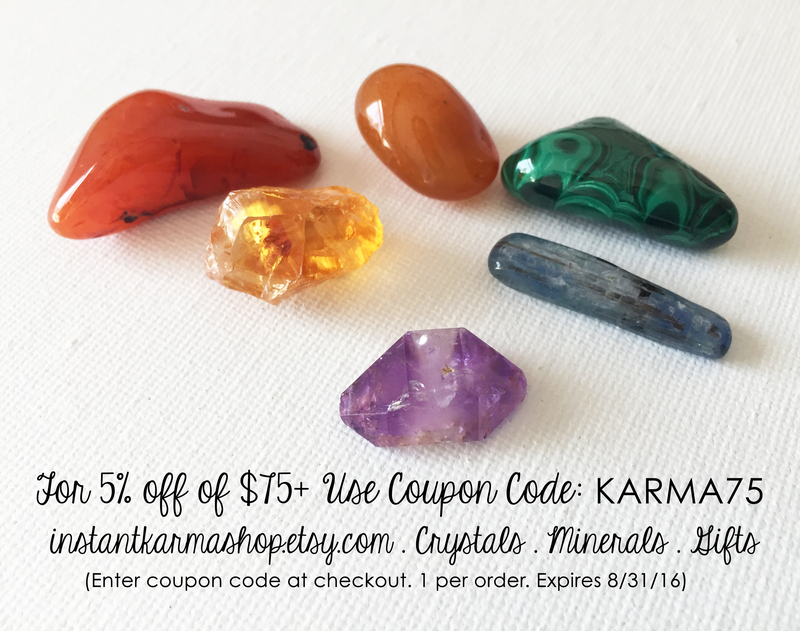 Each entrant can enter a maximum of 12 times (10 times on Instagram, 1 time on Facebook and 1 time on our blog instantkarmashop.com). Odds of winning depend on number of eligible entries received. Ends Thursday February 27, 2014 10pm EST. The winner’s name will be chosen at random out of a hat and will be announced on facebook, instagram and instantkarmashop.com on Friday February 28, 2014. If the winner fails to claim their prize by March 10,2014 prize is forfeited and another winner will be selected. Winners outside of the U.S are responsible for any and all duties and custom charges that may be incurred. 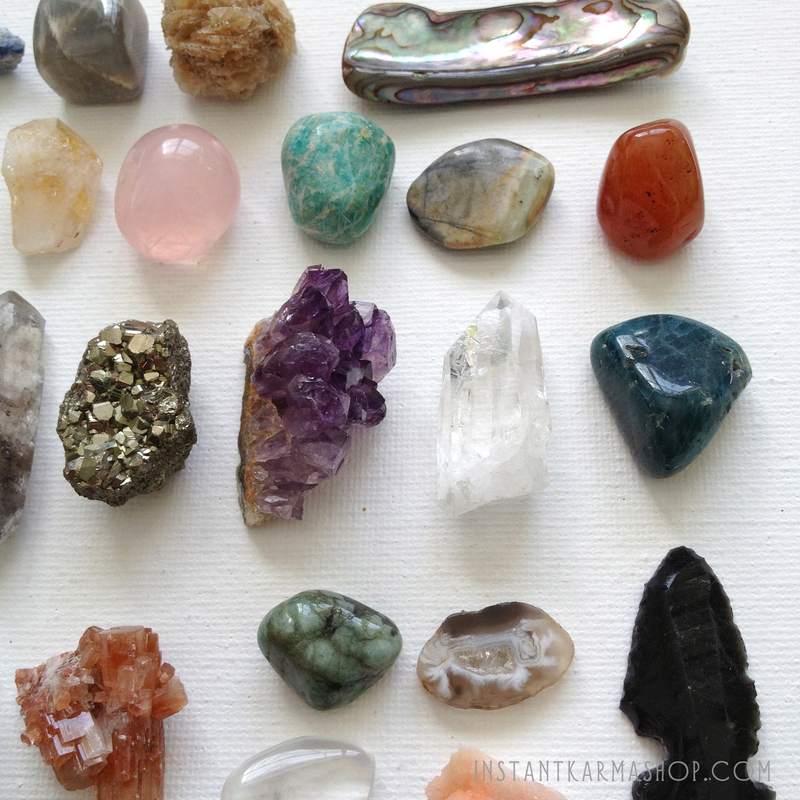 In honor of Valentine’s day we thought we would share our top five favorite crystals for love! 1. Rose Quartz is used for love, happiness, balancing, confidence, and compassion. It emits a calming energy, promoting self-love and bringing peace to relationships. 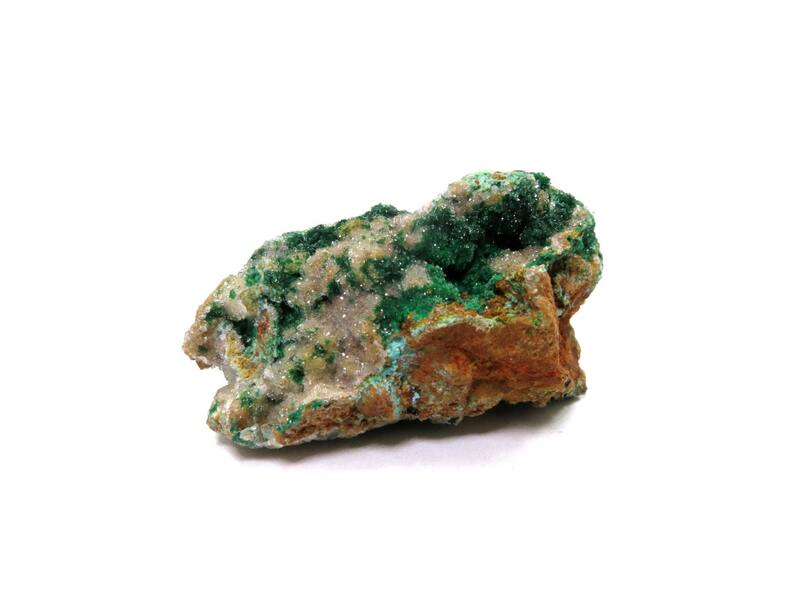 It is an excellent stone for healing emotional wounds and helps diffuse negative stimuli and uncomfortable memories. Helps heal loneliness, ease fear and soothe grief. It is said to help in disorders of the kidneys and adrenal glands. Chakras: Heart. 2. 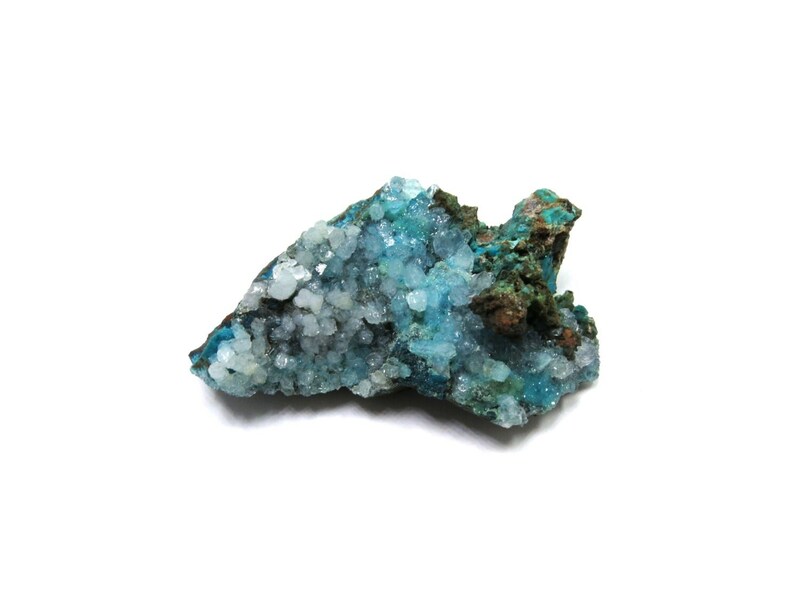 Chrysocolla is a stone that is used for peace, relaxation, balance, wisdom, and love. It clears away blockages in the emotions, and belief systems. It eases emotional heartache giving renewed inner strength and balance. Held in the hand it is said to drive off unreasonable fear and illusions and soothe emotions. When worn the stone grants the power of discretion and increased wisdom. It strengthens expression, communication and increases one’s capacity to love. Chakras: Third Eye, Throat, Heart. 3. 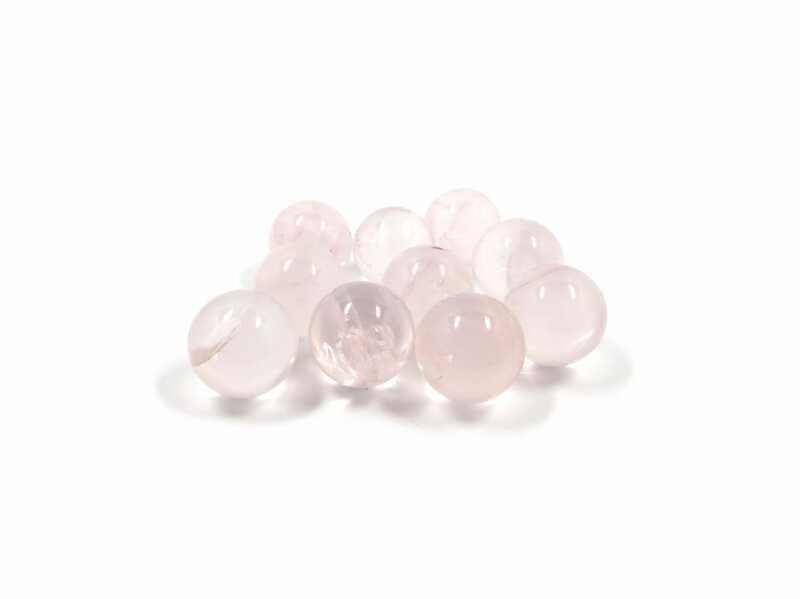 Tibetan Pink Quartz is a rare stone used for unconditional love, self love, inner peace, spiritual protection, overcoming betrayal or abandonment and healing emotional wounds. It is believed to support heart health and is useful for those suffering from auto-immune diseases such as lupus. It can also be used to enhance fertility and prevent miscarriage. 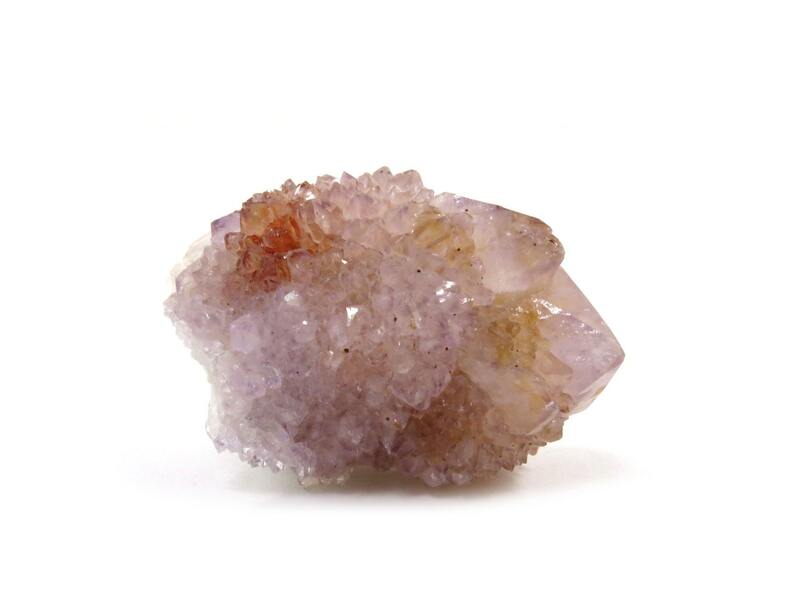 Like Tibetan Quartz it is an excellent stone for healing work on mental, emotional, and spiritual levels. Chakra: Heart. 4. 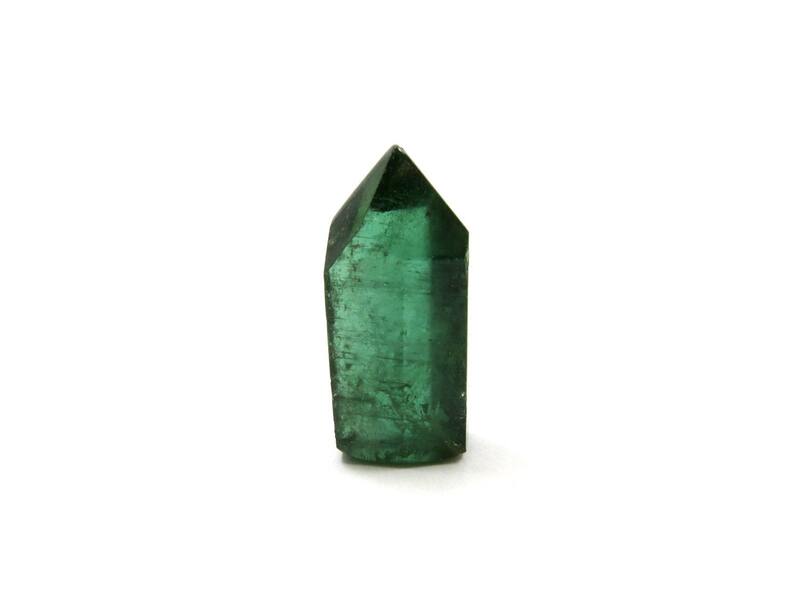 Green Tourmaline is used for love, creativity, calming, strength, compassion, healing, clearing emotional thoughts, and transforming negative energy into positive. 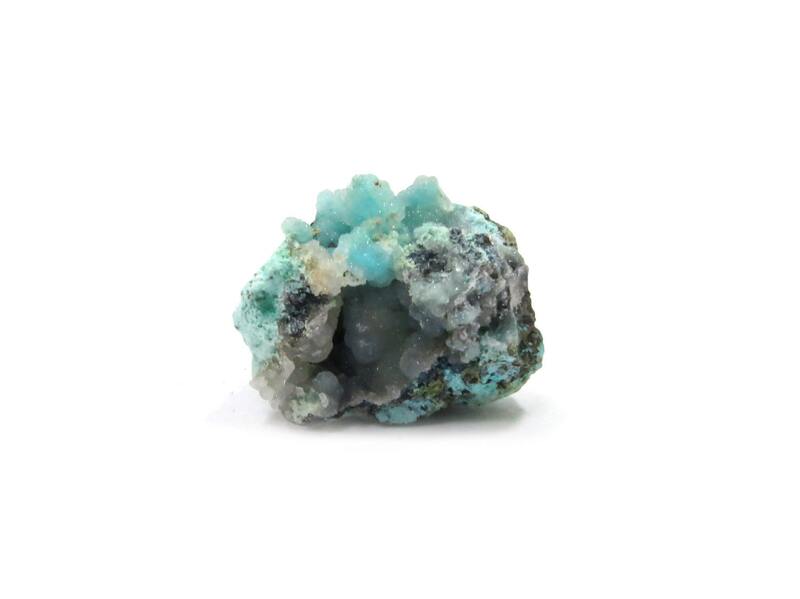 Has also been known to attract success, abundance, and prosperity. It is said to help with weight loss and treats disorders of the heart, eyes, thymus, immune system, and ductless glands. Chakra: Heart. I was always a bit odd in comparison to the average child I went to school with. While other kids were joining the girl scouts and playing sports I was tucked away with my mom studying the magic and wonder of the metaphysical world. 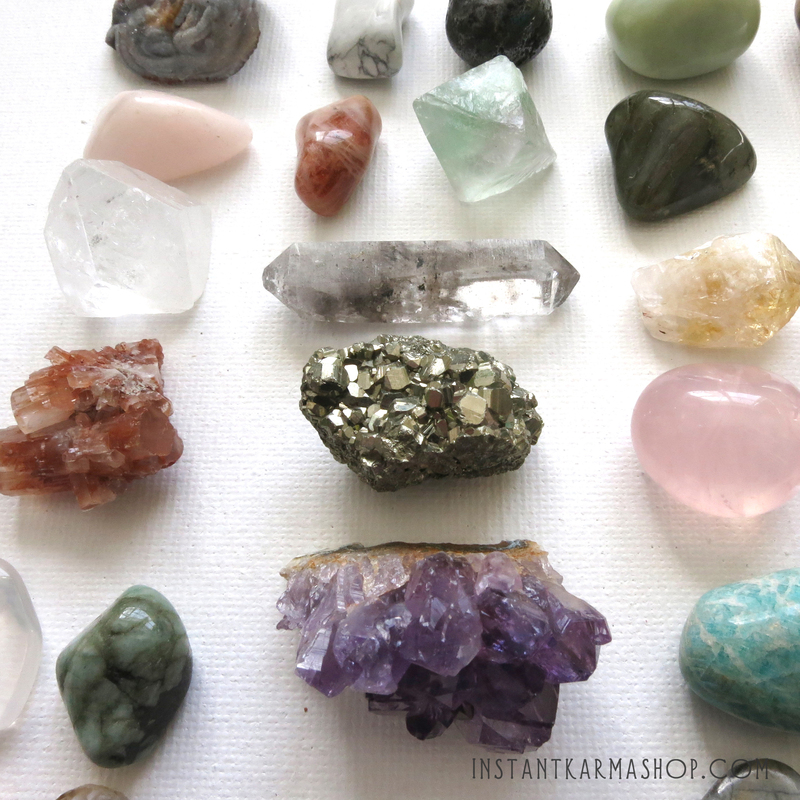 I collected crystals and stones at such an early age that I don’t remember a time when I didn’t. I had tarot cards, pendulums, and runes all before the age of 13. I studied herbology, aromatherapy, magic, palmistry, and mythology. Everything she learned, she eventually taught to me and it was and always will be a special bond that we share with one another. Those memories of her teaching me are some of my most treasured and it was those very special times when I realized that not only is she my mother, she is my greatest teacher and friend. Although she is a very gifted Tarot card reader, she has always had an affinity towards runes and Nordic mythology. In elementary school I was the only child that had luck trolls named after actual Norse dwarves (Nordi, Sudri, Austri, and Vestri), and by the time I was about 13, I was reading and writing in the Runic alphabet as a way to secretly code personal journals and notes. Which they owned in golden days. Runes are a system of pictographs that were used by the Norse before the Latin alphabet. Unlike the Latin alphabet, they were symbols of magic and power representing the forces and objects of nature, and were not necessarily used for writing. It was believed that by calling upon the appropriate rune one could thereby make contact with the force in nature that the symbol represented. The word “rune” not only means letter but also mystery, secret or whisper. 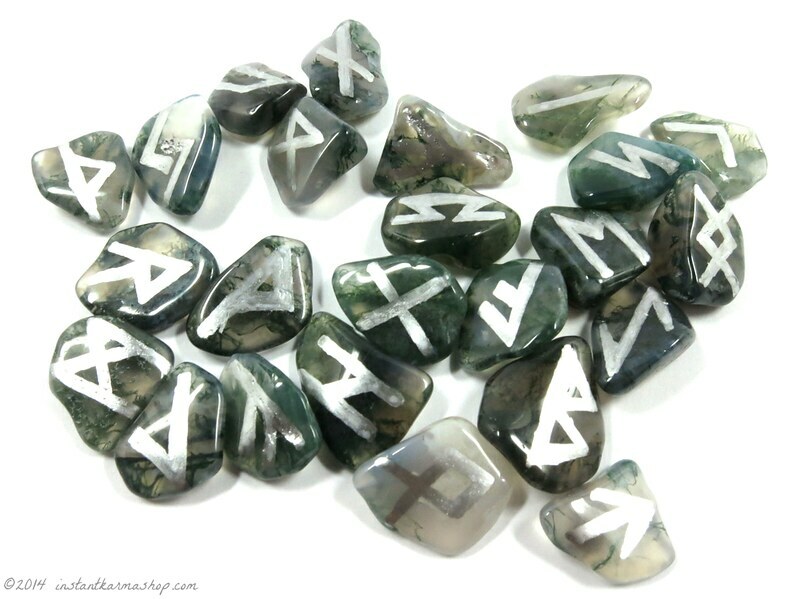 Since ancient times runes have been used for divination, and magic, more than for writing. There were runes to influence weather, to aid the crops, and to heal the sick. They were carved on many everyday, but important items including weapons, drinking horns, spears, the prows of ships, and the timbers of houses. Most people had their own combination of runes, usually for luck and protection. 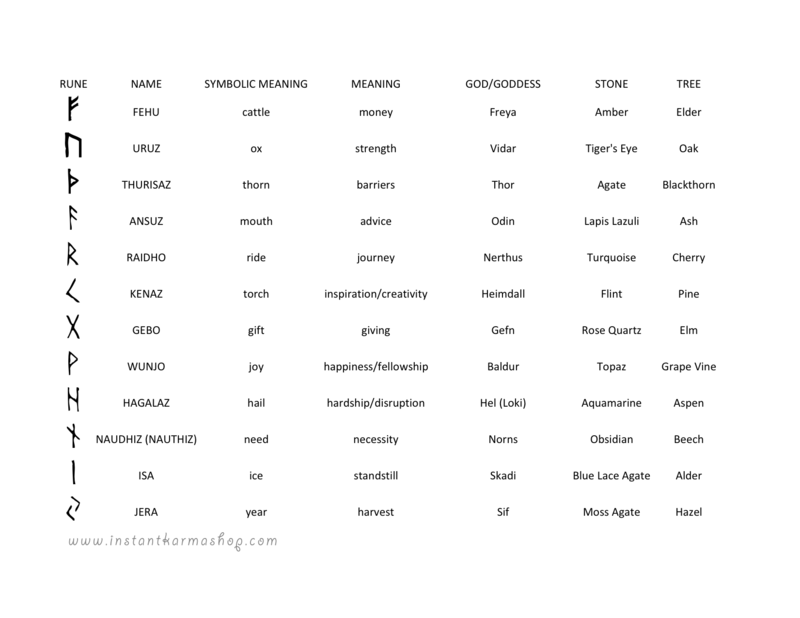 Each rune has an esoteric meaning as well as an everyday meaning and phonetic value. Norse mythology tells the story of Odin the Norse god of the Aesir, who hung himself from the Yggdrasil (The Tree of Life), impaled by his own spear, for nine days and nights in order to gain the knowledge of runes from the Well of Urd with the Norns. When the runes appeared below him, he reached down and took them up, and the runic knowledge gave him power. He later passed on this knowledge to the Vanir goddess Freya. She, in turn, taught him the magic of seidr. Heimdall, the god who guarded the Rainbow Brige, taught the runes to mankind. Rune castings are not fortune telling in the sense that one actually sees the future; they are an oracle from which one seeks advice. The future is not fixed, it changes with everything we do. Runes give a means of analyzing a path and a likely outcome. If you do not like the prediction, it is possible to change the path and therefore the outcome. Rune casting works best if you detail your current circumstances and then ask a specific question. Although Rune readings are sometimes obscure, and not very detailed, they will hint towards answers. This is when the rune caster’s intuition comes into play. 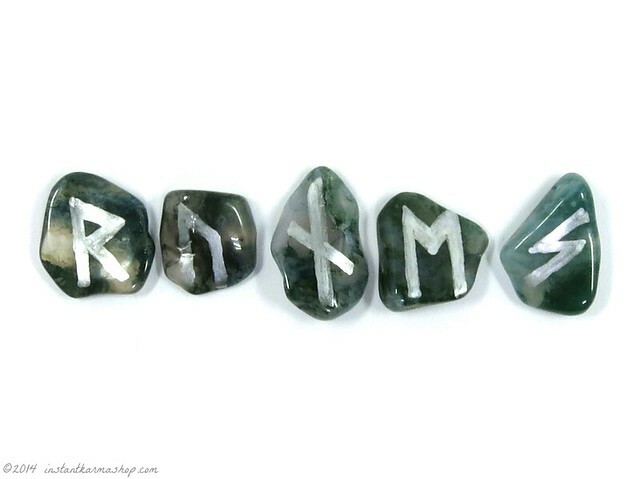 Runes can be made from a variety of different materials, which may include bone, stone, wood, clay, and metal. Traditionally they were made of wood, as according to Nordic myth the first humans were made of “wood, ash and elm”. The Elder Futhark system of Runes, which is the oldest form, is made up of 24 characters. Very often a 25th “blank rune” will be included with sets. In Runic divination, there is no historical support for the inclusion of the “blank rune”. It was invented in the 1980’s and should not be used in a rune casting. If you have a set of runes that includes the blank rune, do not use it in casting, but save it to use as a backup. Should you lose one of your 24 Runes you will be able to create a matched piece using the blank one. 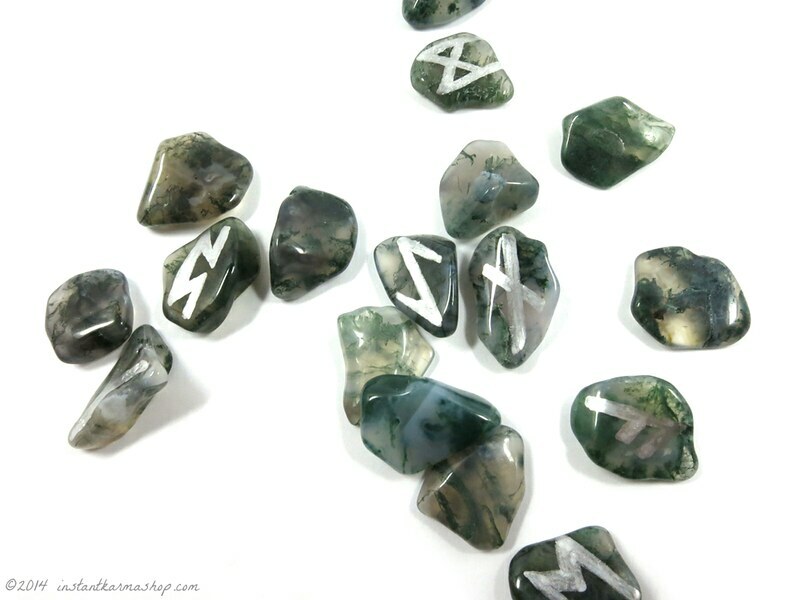 When choosing the materials for your runes, use your intuition to guide you in selecting the best material that is right for your personalized set. When using stones, the possibilities are endless. You can choose a stone because you like its appearance. 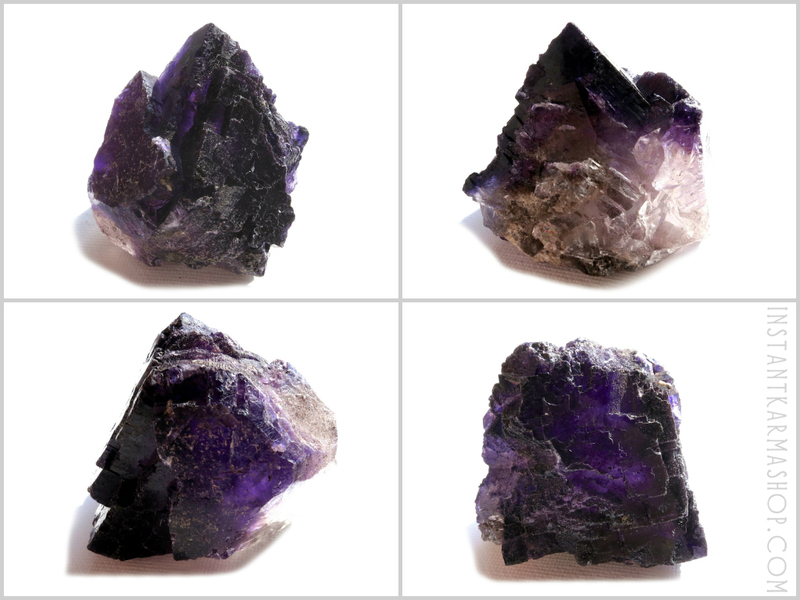 Or using a crystal dictionary, you can find something that has specific properties that appeal to you and your current situation. 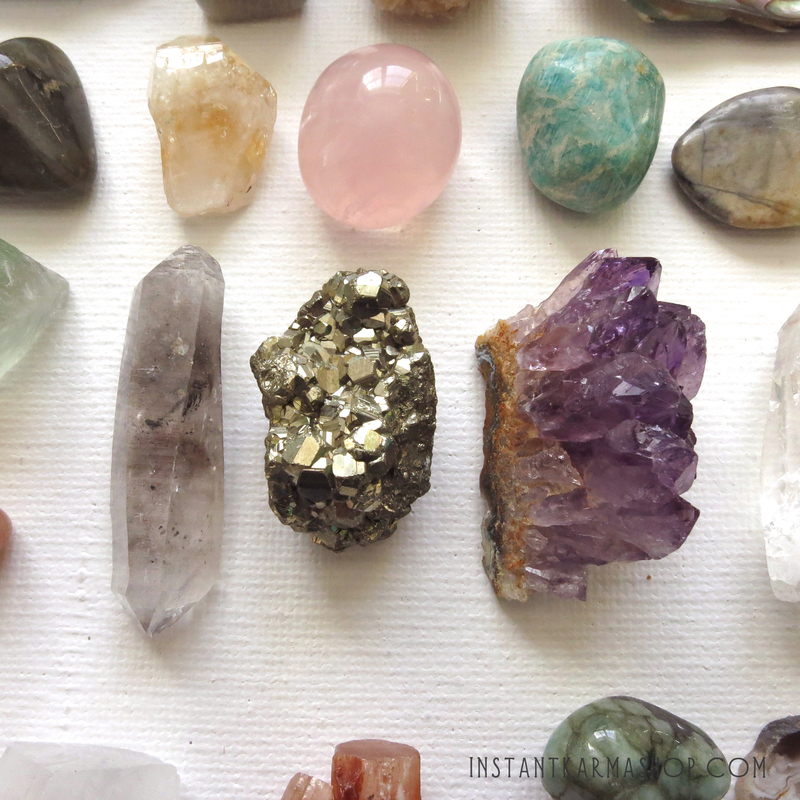 As with most work involving crystals, trust your intuition and you will never be disappointed. 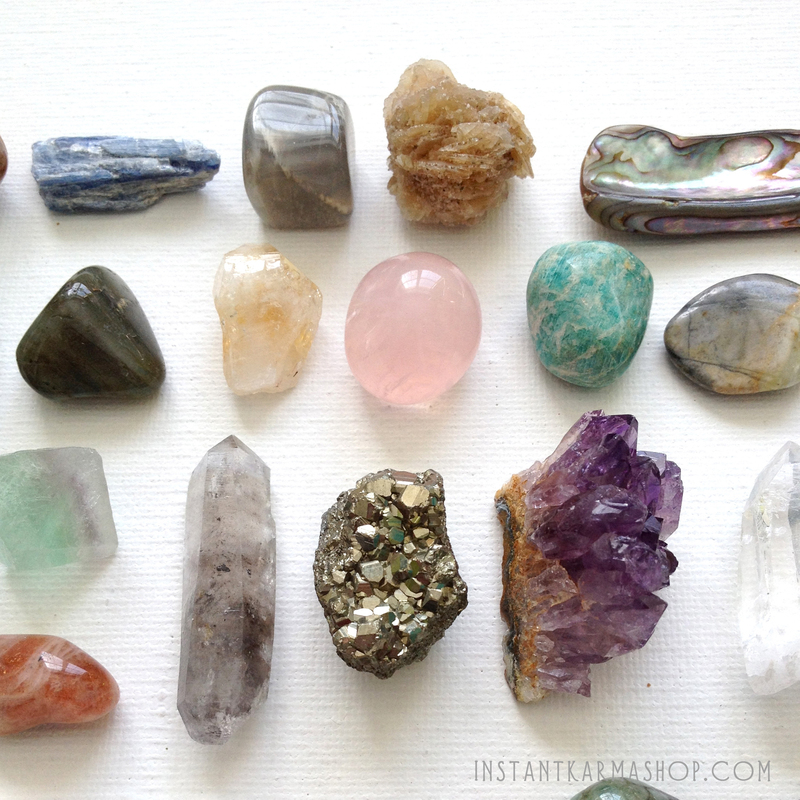 Very often even when a crystal is chosen based on appearance, it will end up being the right one for you. 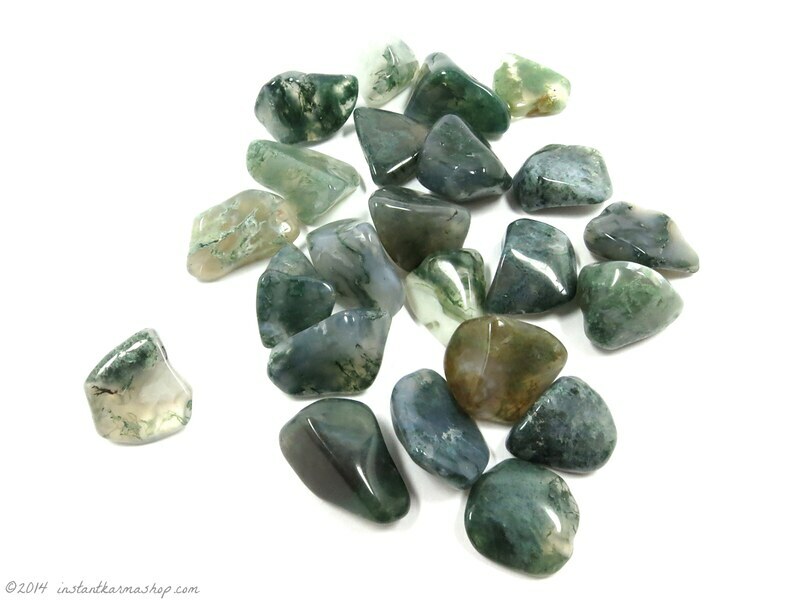 For my set, I chose Moss Agate for the beauty of the stone and the connection it has to the earth. Does size matter? Not really. Again, find something that is right for you. I used very small stones because that is what I had available, but you can make them any size you would like. Just make sure that they are large enough to paint and to read. 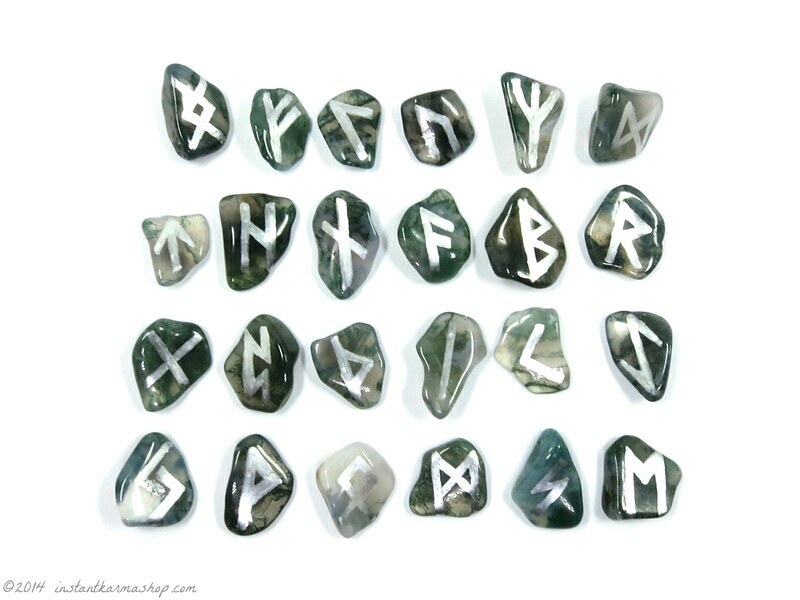 Why paint stone Runes rather than carving them? 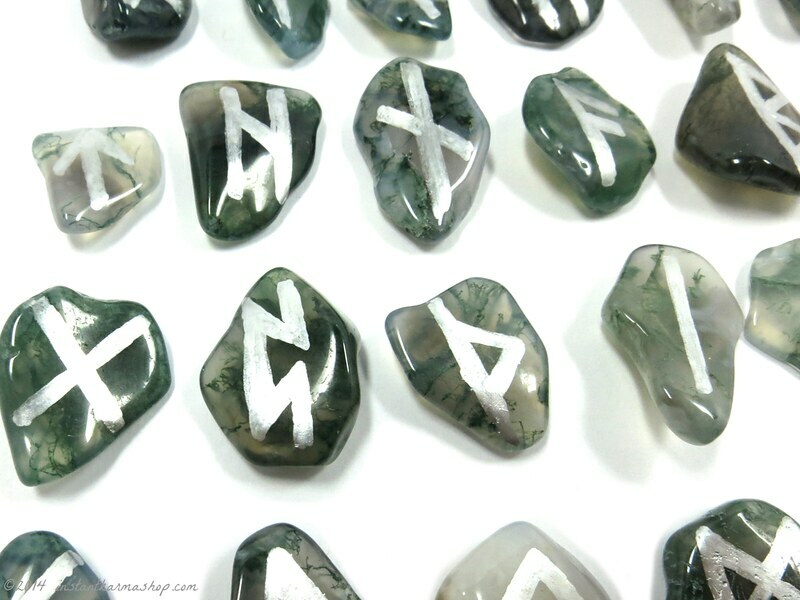 Carving stone Runes requires both experience and skill, and while it is not impossible for a beginner, I’ve found that painting them works just as well and is far less expensive and less time consuming option. Using paint also prevents the mess of stone dust and the danger that may come from carving certain toxic stones. The method used here to paint the stones is also the same method that is used for curing paint for use on ceramic mugs and glass. By baking the stones after they are painted and dry you are curing and hardening the paint making a much more permanent mark and therefore does not require sealant. 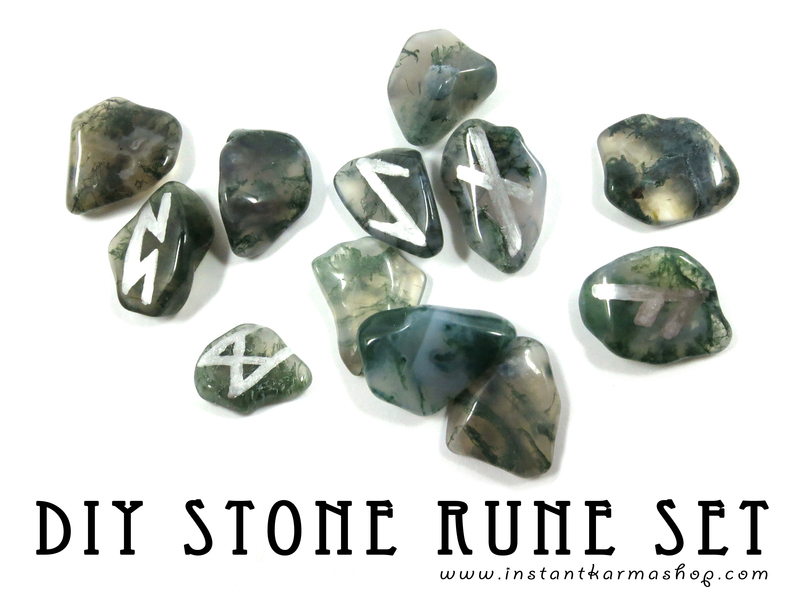 Please keep in mind that if you decide to use other another type of paint marker or stone it will be necessary to do a test Rune first to ensure that the baking doesn’t cause discoloration of any kind. When testing this method, I tried several different paints and stones and the combination I have used here provided the best results. If you try a different combination and it works for you, please let us know in the comments section below, we would love to hear about your results! 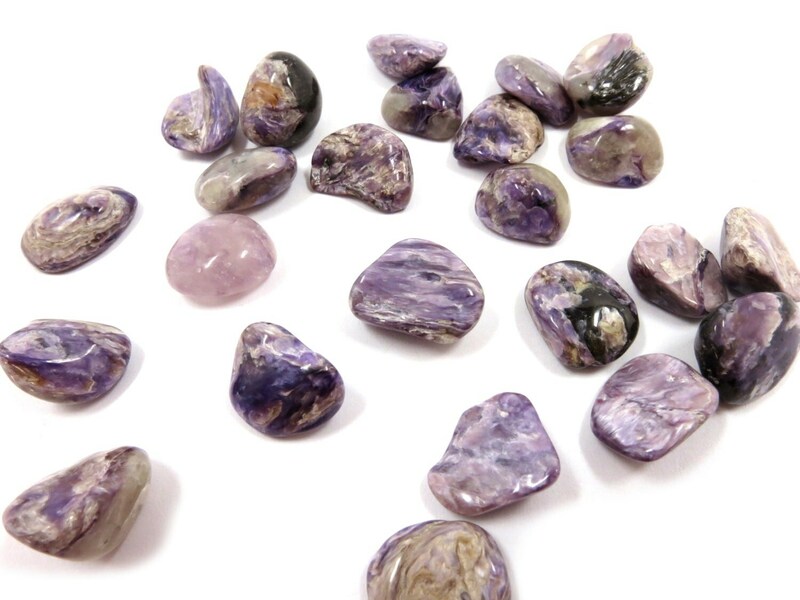 Prepare your stones by washing them with gentle soap and water. Once they have completely dried give them a swipe with some rubbing alcohol using a paper towel or cotton ball to remove any residue or oil. Once the alcohol has dried completely you can begin painting your stones using the chart below [ download a pdf version here ]. If you are not familiar with the characters it may be a good idea to practice on a piece of paper until you feel confident with your work. Allow your runes to dry untouched for 24-48 hours. They will dry to the touch within a short time but you want them to dry completely and the extra time will ensure this. 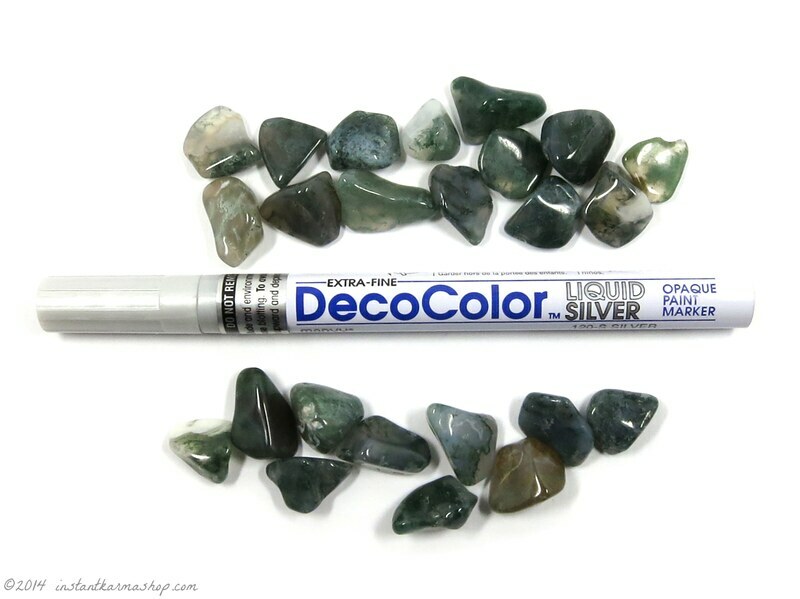 Once your stones have cured for a day or two place them painted side up on a small baking sheet lined with aluminum foil. Place them in a cool oven on a rack placed in the center and set the temperature to 220° Fahrenheit. Once the oven has reached 220° Fahrenheit, continue to bake the stones for 30 minutes. After 30 minutes, turn the oven off and allow the stones to cool inside the oven. When the stones are completely cool, they are ready to be used! One Rune Reading: This type of reading is best for a specific question. Focus on your question and pull a rune. The rune may indicate a simple yes or no answer, or it may be more conditional. The Three Rune Reading: This type of reading is useful if you would like to get some insight on a specific situation. Select one rune and place it face up, then select a second and place it next to the first, the final rune once selected should be placed next to the second. The first rune represents past events, the middle one is the current situation and the third will represent the end result if the situation remains unchanged. Scattered Rune Reading: Focus on a question or situation, take all of the runes in your hands and scatter them. 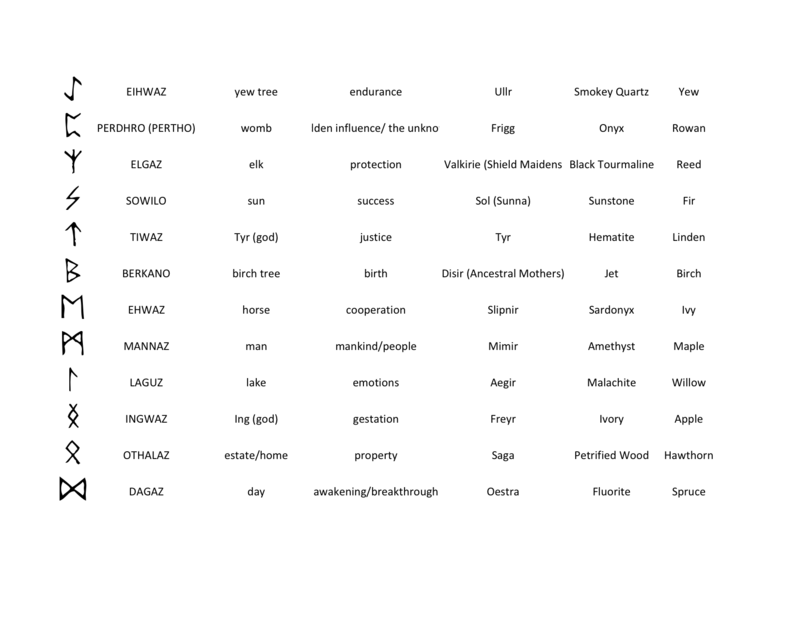 You can read them all in relation to each other or focus on small groups that may have landed together. Nine Rune Reading: Pull nine runes and hold them in your hands, focusing in your question. Then scatter the runes. Read face up runes first, as they will relate to your current situation and the circumstances which led to you there. Northern Mysteries and Magick: Runes & Feminine Powers by Freya Aswynn (Also titled Leaves of Yggdrasil: Runes, Gods, Magic, Feminine Mysteries and Folklore). January’s birthstone, Garnet gets its name from the Latin granum or granitus, which means grain or “like seeds” due to its resemblance to Pomegranate seeds. 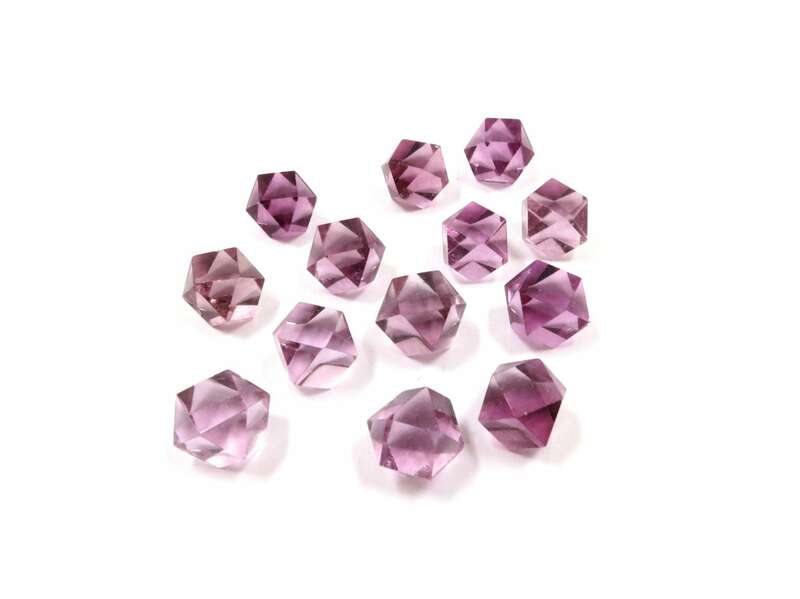 It was referred to as the “glowing” gem due to its intense color and the belief that it glowed with its own light. 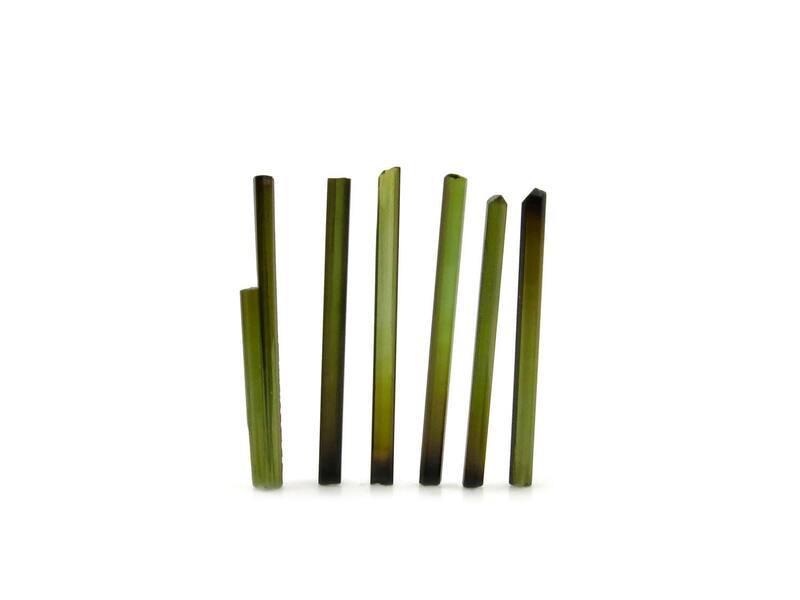 It has been used since ancient times (centuries before Christ) for both its vibrational properties and beauty. One of the earliest known, and most likely the most famous, was a Garnet called “The “Wise One” which was set in the crown of the German emperor Otto (912-973). Warriors and knights used garnets to decorate shields, and weapons which they believed would protect them and give them the strength and courage needed to endure battle. In India, Garnet is seen as a holy stone that “enlightens the soul and gives wisdom”. It has its place in Vedic texts as part of the story of the death of Vala. Throughout the centuries Garnet has held a very important place as jewelry, personal talismans, in the home, and was said to relieve countless ailments and emotional issues. Due to its red color it was said to be good for healing the blood and the heart. It was also a popular antidote for poisons as well as a treatment for inflammatory disease, over-indulgence, driving away the plague and evil spirits, and bringing sleep to the sleepless. Worn on the body as jewelry or as a talisman, it was said to attract riches, wisdom, honor and glory. It assured a long life, large family, and great happiness. Garnet is a very powerful stone used for love, grounding, healing, protection, meditation, self-confidence, and strength. 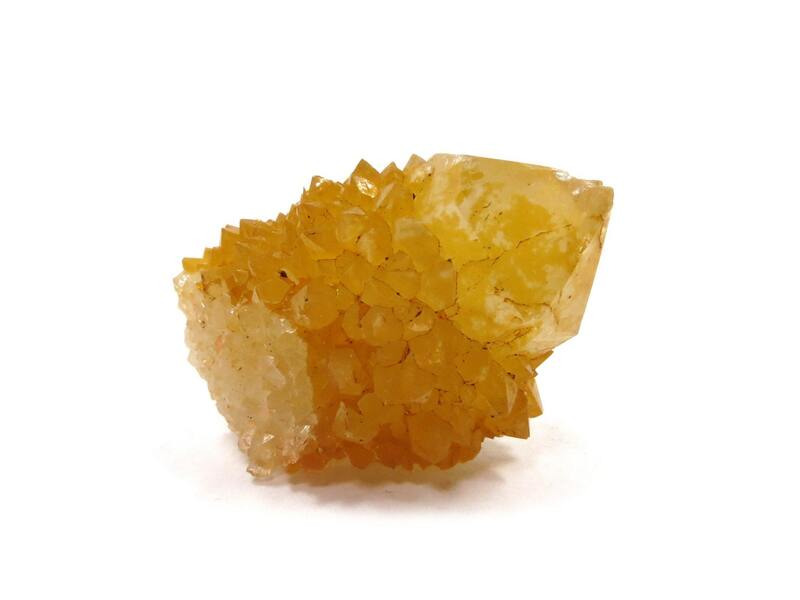 It increases sexual energy, psychic ability, and extracts negative energy from the Chakras. Also called the stone of commitment, Garnet brings devotion, rekindles feelings, renews and strengthens love, and is often exchanged between parting friends to symbolize affection and magically ensure they meet again. Known as the “stone of health” Garnet has been used to treat skin conditions, inflammatory disease, insomnia, and disorders of the spine, heart, lungs and blood. (Chakras: Heart, Root). Color: Ranging in color from deep burgundy red to rust. Newer varieties may be green, orange, yellow, and black. Country of Origin: Bohemia, Madagascar, India, Canada, South Africa, Australia, and United States of America.